Netbook and tablet users looking for more screen space to display content from their favorite websites are getting some help from a pair of popular Internet browsers. Google and Mozilla are testing versions of the Chrome and Firefox browsers that hide the bar used to show the URL of websites you visit. The features are experimental and it's unclear if they will become part of the mainstream. Web surfers who want to always know where they are may have security concerns. Here's a primer on how it works, as well as the pros and cons. In the latest build of Chrome Canary, an early stage version aimed at developers, you can enable "Compact Navigation." Once enabled, you can right-click on any tab and select "Hide the toolbar." The URL will disappear. To see the address bar again, click on an open tab and the URL bar will appear underneath. In Chrome Canary 13, just enter "about:flags" in the URL bar, select Compact Navigation and restart the browser. Ars Technica points out the feature only works in the Windows version of Canary, and it's not currently supported on Mac OSX. Mozilla is also experimenting with a similar feature for the Firefox browser. 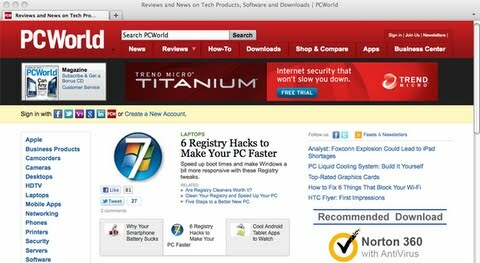 A new add-on for Firefox 4 called LessChrome HD will hide all the toolbars below your open tabs whenever they're not in use. The toolbars reappear when you move your cursor over a tab, or when you switch tabs. LessChrome HD can be installed from the Firefox Add-ons page. The advantage: Hiding the URL allows users of netbooks and tablets to have a bit more space to display the content of a website. The drawback: The tradeoff can be dangerous when users don't see the URL of a page -- making them easier targets of phishing attacks. Wolfgang Gruener of Conceivably Tech notes that once you are at the web site you want, there's no need to permanently display the address, unless you are worried about security. Firefox and Chrome hold together 43 percent of the browser market (StatCounter), so they could push for a less ubiquitous URL bar. But Microsoft, which holds the other half of the market with Internet Explorer, is showing no intention to let you hide the URL bar any time soon.